This enhanced true-color composite image shows a portion of the eastern face of Rocky Mountain National Park in northern Colorado. The scene was acquired on October 5, 1999, by the Enhanced Thematic Mapper Plus (ETM+), flying aboard NASAs Landsat 7 satellite. The image was produced using a combination of the ETM+ visible and near-infrared bands 3 (red), 2+4 (green plus near infrared), and 1 (blue). For perspective, the scene was draped over a digital elevation model of the region. The topography of the mountains in the background of this image was created to scale so that their relative heights are not exaggerated. Toward the south (left) end of the mountain range stands snowcapped Longs Peak, with an elevation of 14,255 feet (4,334 m). 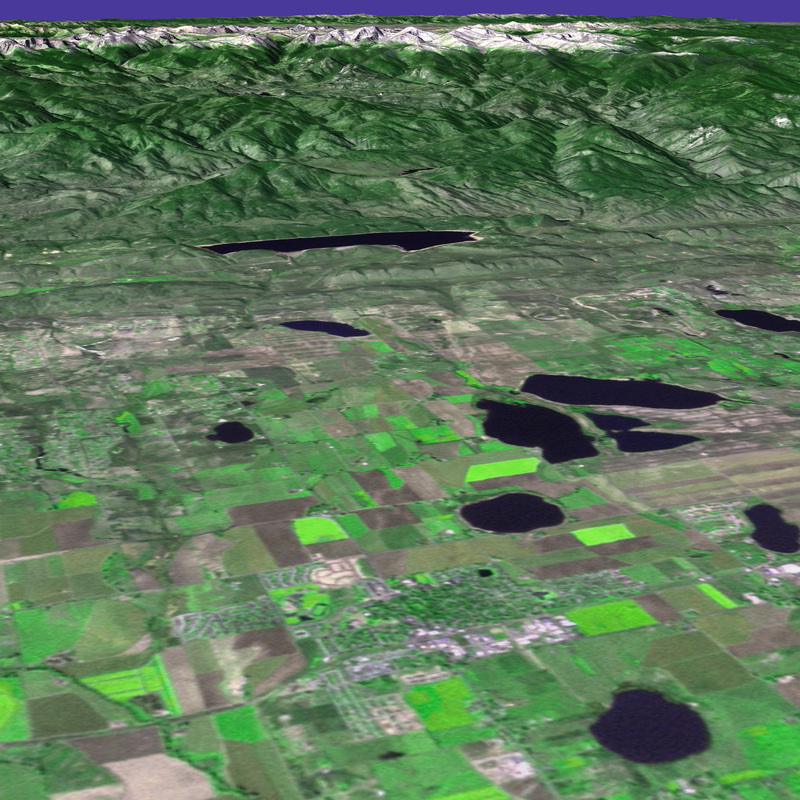 White pixels show areas of snowcover and green represents vegetation. Note the geometrical patterns of agricultural fields on the plain in the foreground. 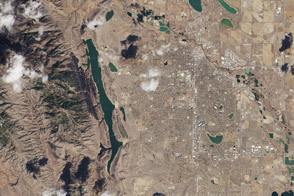 This scene is looking west by northwestward across the plain where the town of Berthoud is situated (whitish-grey pixels) in the foreground. Berthoud is located roughly halfway between Fort Collins and Boulder, Colorado, on the map. The large, dark blue blobs dotting the landscape are lakes.